Every September is Organic September. It’s a time for the food industry, producers and consumers to get together and celebrate all the things that set organic foods apart. Organically farmed, grown and reared products are usually of exceptional quality and the way they are produced is lighter on the environment and higher on welfare than standard equivalents. 1. Organic at every stage of life... Our Organic salmon are grown from organic smolts (juvenile fish). These are only reared in the spring, following the salmon’s natural wild reproductive cycle. 2. A balanced diet... 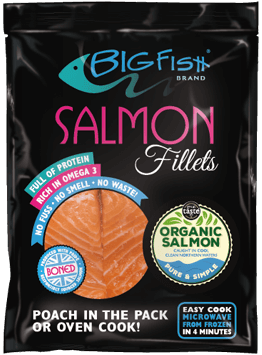 These salmon eat feed made only with purely organic-approved, natural ingredients from sustainable sources which are GMO free. The feed includes at least 50% fishmeal made from off-cuts intended for human consumption. 4. More freedom to roam... Salmon in organic systems are given more room to grow and shoal in their pens – usually twice as much space per fish than conventional systems. 5. Clean living... Organic salmon are reared in the cleanest possible environment, with an especially strong flow of clean salt water. This and the low stocking density ensures they are lean and strong, which makes for a better tasting fish!